I make no secret of the fact that I love white noise because it’s immensely helpful in helping your children cry less and sleep better. It’s pretty much the only “no fail” baby sleep tool at your disposal. Seems simple enough: buy one of the many commercial baby white nose machines and turn it on. No brainer, right? Well today Pediatrics published study on white noise saying that the cute little baby white noise machine you got at your baby shower is too loud. The study took 14 infant sound machines (those marketed specifically for use with babies), turned the volume up to the loudest level, and measured the sound levels at three distances designed to approximate being hung directly on the crib rail, table-side next to the crib, or across the room from the crib. According to these measures, all sound machines were above the recommended volume of 50 dB when measured from crib or table-side distance, and some were even reaching levels of 85+ dB. Yes. This is too loud. The New York Times has a great writeup on this. The author asked some of the leading manufacturers of baby white noise machines if they could specify the volume output of their devices. Graco declined to answer (bad move Graco, it makes you look like you have something to hide n’est-ce pas?). Michelle Landesman, the customer care director at Marpac, said that the company’s Dohmie sound conditioner for babies has a decibel range of 50 to 75. “Our measurements are only taken six inches away from the machine, and that’s obviously much closer than we’d recommend,” she said. [/pullquote]Probably by this point you’re probably feeling like this whole white noise thing is a mess and better to stop using it entirely because…why risk it? I hear you. Sometimes science is scary. But before I start making staid references to babies and bathwater let’s take a look at what we know…. The study does not say that white noise is bad, it said that many baby white noise machines are too loud and that is bad. White noise devices marketed for use with babies are, if set to the loudest volume, likely surpassing the 50 dB guideline. Using white noise of appropriate volume has many scientifically documented benefits to your child. Dr. Karp maintains that the use of white noise, used appropriately, is just fine. In the NYT article, Weissbluth backs it up too. The issue isn’t that white noise is harmful, the issue is that some of the gadgets we’re using are probably too loud. They might be OK if you turn down the volume or place them more than 200 cm away from the crib. You want to use white noise that is no louder than 50 dB, approximately the volume of somebody taking a shower. As a comparison, normal human conversation is 60 db, so 50 dB is quieter than just about everything that you and your baby do during the day. Also, it’s important to note that babies don’t hear like you do. Your baby as an auditory threshold of at least 25-35 db until their first birthday (adults have an auditory threshold of 0 db) so 50 dB is a very conservative volume and sounds far more quiet to your child than it does to you. But even so, how can we make sure we’re not overdoing it? Never put a white noise machine in or immediately next the crib. “Reality check” the volume where your child sleeps: does it sound like the volume of somebody taking a shower to you? You probably don’t know (or don’t care) but I’m actually a reference in this peer-reviewed scientific study published by Pediatrics. No I’m not making that up – this study on white noise uses ME as a reference. Holy crap that’s bananapants right? The suggestion is that I’ve been telling parents to blast their children with white noise. And sadly this couldn’t be farther from the truth. There are many reasons I post infrequently (2 kids, life, I’m lazy) but one of the biggies is that I put a lot of time and research into my blog. If I’m giving advice I do everything possible to ensure that it’s backed up by credible science wherever possible and if there is ever a safety issue where there is no credible science to be found (baby swings anyone?) I’m always clear that it’s something you should discuss with your pediatrician. There is nothing more important than the safety of your child. Absolutely nothing. I get it. You get it. And never, at any moment, do I forget that fact. My post on white noise (published April 2011 and unedited since that time) doesn’t recommend the use of baby white noise machines and is clear that the volume shouldn’t exceed 50 dB. That’s what I said 3 years ago and that’s what I say today. Everything I’ve written is in 100% accord with the white noise study. So I’m going to ignore the implied critique and focus on the upside – The American Academy of Pediatrics is writing about ME for a change. Yay? But enough about me. Is anybody else freaked out about this? And if so, did I help or just make it worse? Thank you so much for bringing this up! I didn’t want to poke at the article that poked at me (*ahem*) but they come to conclusions not backed up by the study. The study says that some devices are too loud. GREAT! That’s really the only finding that they can come too. The idea that they shouldn’t be used for the entire time your child is sleeping is backed up by…what? Nothing. There is no evidence that reasonable white noise used for the duration of your child’s sleep is problematic. It certainly isn’t suggested by any of the data in this study and nor is it suggested elsewhere. Thank you so much for reminding me about that! I assume you HAVE read through in a bit more detail? And still no indication that there is any correlation between the bedtime whitenoise and developmental delays, yes? What, so weeks of rain and wind every night, or air conditioning or fans humming and the accompanying ‘white noise’ will damage my child’s brain development? And their evidence for that? Sloppy science. You’re right, it is sloppy science. I didn’t want to pick at it in the post because they picked at ME and if I picked back I would look small and petty. But now the internet is awash with “don’t use white noise all night” and “white noise is going to damage your child’s hearing”, none of which is substantiated by this or any other current research. This research simply measured the white noise machines. That’s all they can say – this is how loud they are at various distances. The end. The rest of it – like not using reasonable white noise for the duration of your child sleep – is simply opinion. There is no scientific evidence to show this is a problem and there is a huge amount of overwhelming anecdotal evidence to suggest it’s fine. The cool part is that my picture is in it (what the what?!?!). The uncool part is that they’re yet again reiterating the “white noise = bad” message and that’s frustrating. Given that sleep is one of the (if not THE) most important factors for brain development, maximizing it should be the focus of the research. We all know that babies wake up 5,000 times over the course of the night. So if you put them to sleep with white noise, every time they wake up and expect the environment to be exactly the same as it was when they fell asleep, it means you are up and down all night turning on the white noise machine again. Seems like the researchers might not have kids to understand the impracticality of leaving things on timers. Agreed. What would be helpful would be some concrete studies on what IS too loud. Everything I’ve found creates a compelling argument that kids hear far less than we do and what is loud for us is not loud for us. Which doesn’t mean you CAN’T be too loud – but instead of spreading fear and self-doubt without scientific back to the claim that “all night long” is an issue, why not create some studies to help provide clear and useful guidelines to parents? Most of the regular sound machines that we have come across do not have white noise…I was already using an expensive brookstone one that had the sound of the rain etc…but it never worked. Actually studies on rats exposed to continuous white noise has shown to be harmful to brain development and interfered with the “wiring” of the brain. This is a 2003 study. I am not aware of any studies that support or refute so folks need to take it for what it is. Also, a more recent study shows that white noise is beneficial to learning only in children that have attention problems. Some believe that white noise at home creates a learning atmosphere that MUST be present outside the home. I haven’t found a study that does this but one needs to be done to see if attentive kids are exposed to less white noise at home in comparison to inattentive kids. Sadly the infamous rat study is like my husband’s Birkenstock sandals: despite my best efforts, they never seem to go away. Admittedly there is some controversy about what appropriate is, and I always suggest the most conservative volumes. That being said there is pretty compelling evidence that babies hearing is far less developed than our own, and that their threshold to even register sound is much greater than adults. While the evidence doesn’t currently exist I wouldn’t be surprised that in 10 years we find out that the white noise we use currently isn’t nearly loud enough! http://www.howloudisthat.com/results.html ….this site did sound level tests on 9 leading hairdryers and decibal levels even on low settings are surprisingly high…i will still use the hairdryer as it works wonders with my 3 mth old , i only have it on for shortbursts ..but will have it further away from his head now. I use white noise with my daughter. Ive used it, since I read these blogs, with her since she was about 2 months old. She will be 3 years old in August and we still use it. I don’t see a problem with it. It helps her sleep more sound. She definitely does not have any hindered development. First: even though they didn’t come across as your biggest fans, I say it’s very cool that you got referenced. WTG Alexis!! The study is a bunch of nothing: some guys sitting around with a sound meter, passing time. They didn’t show that any of these devices were harmful in any way, just that they potentially could be, if turned way the heck up and pressed up against Junior’s noggin. Which no one is suggesting be done. No truly I AM stunned (happy? not quite yet but I’m getting there) that they referenced me. So I guess this means I’ve arrived. Woot! Somewhat related – I’m curious about how accurate those sound meter apps are. I had one of the ones you recommended (I can’t remember which, to be honest). I used it to test our white noise machine. I was standing next to it, so I was probably about 5 or 6 inches away, and it registered very high – I believe about 80? So I turned down the machine until it said 50 and I might as well have just turned it off at that point. It did absolutely nothing to drown out the ambient noise of our house and neighborhood. So I deleted the app, turned the sound machine back up, and never gave it a second thought. I should add that the volume is definitely not cranked all the way up. Anyway, my point was – I wonder if these apps that we have just aren’t accurate at all. Maybe there is a discrepancy between our 50dB and the scientists’ 50dB, know what I’m sayin’? Worth a few bucks to check out? Because if you can’t hear it she DEFINITELY can’t hear it. I have the SPLnFFT app and like the previous commenter said 50dB is really quiet. For example I am currently sitting in my office with the door closed with only the faint hum of my computer and the app is currently reading 50dB. If a shower is supposed to be equivalent to 50dB this app is not giving an accurate reading. If I have my babies sound machine on at the level this app thinks is 50dB then it will be so quiet that I might as well not have it on at all. Yeah I can make no claims as to their accuracy. I’m sure it depends a ton on the microphone in your phone and I have no idea how accurate they are. Somebody on FB had the same experience – total silence was registering as 50 dB. We have used homedics soundspa(this one http://www.homedics.com/soundspar-auto-set-clock-radio-with-time-projection.html) since we got married so, when we had a baby and learned about the magic of white noise, we just used that – one of the sounds that maintained a steady rhythm and was enough like static on a radio to work… like a storm or ocean waves… we have done that with both children – they sleep in our room at first for a while and we have one in there, then put an identical one in their room when we move them. I wonder how this kind of sound machine – not specifically for babies – would compare? I did notice that the model we bought in 2006 (our wedding gift) does not get NEARLY as loud as the one we bought in late 2010/early 2011 (it all blurs with my sleepless, reflux firstborn) and then the one we bought in october 2012 for our second born – the latter two get MUCH louder than the original model… so I found myself turning them down to about 3/4 volume because the sound is irritating to me. I never thought to check the dBs… I just wonder how they would compare to the ones made specifically for babies. Thanks!! I have FUN with bows and headbands with my daughter – NEVER would have thought I’d do that haha. We love our white noise for sure! Having it when we travel even now with our almost-3-1/2 year old helps soooo much to ensure he still gets his sleep! I have the volume all the way up on the one in Munchkin’s room. In our old apartment it was across the room near the door. Now its closer to the crib (mostly out if convenience as outlet is behind the dresser.) Tomorrow I will be moving the sound machine closer to the door, so yes, a little freaked out. I’m actually surprised my mom hasn’t said anything to me about the volume. She is more paranoid about things than I am. I’ve also had the volume turned all the way up and only a few feet from the crib. It was the only thing that kept the sounds of my 3 yo from waking the baby. I will be turning the volume down and moving the machine, but oh my, I hate feeling like I’ve already damaged him! I just checked the outlets in her room and there is no outlet behind the dresser near the door. I did move it significantly away from the crib and closer to the window. Our sound machine is a cheap $19.99 ConAir one. The volume on its highest setting isn’t even that loud. Don’t freak out – chances are it’s totally fine. When you stand in the bedroom, does it sound too loud to you? Does it sound like somebody taking a shower? The truth is a relatively simple piece of research that measured sound machines is getting blown up in ways that aren’t back by the study. It frustrates me that it’s making thoughtful parents like you question your parenting. Don’t. You’re doing great. You didn’t damage your baby. There is no evidence here or elsewhere that it’s a problem. There IS evidence that babies ears are far weaker than our own and that white noise must be loud to help. Thanks, Alexis. I <3 Dr.Karp. Honestly the “benefit” of white noise technically doesn’t seem to go past the first birthday so if you want to let them “win” this one (just to they leave you alone so you can go watch HBO in peace) it’s OK. Frankly white noise is a great sleep cue and it reduces the chance that the barking dog/garbage truck/doorbell is going to blow naptime for you. And it certainly isn’t hurting anything. I’m actually really concerned about this. It seems to me a hair dryer is way louder than what the study recommends (am I wrong in that you recommend the hair dryer too? ), but that’s the only thing that worked for my babies. An iPad app wasn’t nearly loud enough. Now we use the homedics sound spa up all the way. I do that too. And it’s like a foot away from his crib. I’m thinking that I might just move it farther away. I really don’t know if the Homedics SoundSpa goes up past 50 dB – at its highest volume on the ocean setting, to me it sounds like a shower, so I thought I was fine. I’m still not convinced that the Homedics one is problematic, but like I said, I’ll probably move it away from the crib. I wouldn’t freak out yet. For starters, using REALLY loud noise (vacuum, blow dryer) for temporary bouts of crying (usually when they’re newborns) is fine. It’s brief and actually far quieter than the volume of crying. Meaning the noise HAS to be loud to even register over the sound of their crying. But nobody is suggesting you run the vacuum all night! If it sounds like the volume of a shower to you it’s probably just fine. Honest. we’ve used white noise with our daughter since she was around four months old, for naps and through the night. At first we used a cheap radio and now she has my old stereo in her room. I’m not worried because we’re not using a special machine, the stereo is across the room from her, and because at night if I go in to give her a night time feed I sit right beside it and it’s never felt too loud to my ears. It’s never been anywhere near fully turned up. I am wondering when she should be weaned off it to avoid her needing white noise at night her entire life? Sharon, I was worried also about making my baby dependent on white noise. But I recently realized that, even though my parents never used white noise, I experienced as an infant decently loud environments (due to street traffic) and then as a child very quite ones (almost no noise at all), and I am now one who has trouble sleeping with even a little bit of noise. (I am actually using white noise myself now) But then it seems that later experiences, as a child, might have affected me more than the earlier ones. I am no expert but it seems to me that it’s really hard to predict what it’ll happen to your child years from now. Mind you, I am not saying that weaning from the noise would not be considered, but only that… who knows what will make her sleep well years from now! Anyway Alexis if you have thoughts/knowledge on this please share! “White noise is easy to wean off of. The benefit of white noise technically fades after their first birthday, as does the risk of SIDS. But unexpected noises (garbage trucks anyone?) can muck up a nice nap so it can be a good idea to stick with it. Really after their first birthday it’s up to you – you’re tired of it then gradually wean off it. You have a noisy household then maybe you keep it around. There is no wrong answer really. Totally helpful especially to calm my husband is now really worried about hearing loss because he caused his own tinnitus and now is a bit paranoid about everything! Totally off topic, we’re spring forward already!! If you have any time, any hints or ideas on what to do with the time change? I don’t think I’ve found a post on it, if you did please just point me in the right direction. I should write a post on it because people are always curious although my honest answer is – it depends. Sometimes DST is a really helpful way to shift a sleep schedule in a good directions. Other times it just messes up your good thing. If you’re facing the latter I might consider making the change gradual over a few days (say 20 minutes a day). Alexis to the rescue! Thanks for writing this balanced response to the study. Ah thanks Lily – cheers! I like cool commenters too and have no idea how I’ve gotten so lucky! Although in all fairness I didn’t really reevaluate my recommendation, I just saw that what I wrote 3 years ago is still cool. BUT if we learn something that brings new light to an old subject of course I would reevaluate! Look my Mom smoked when pregnant with me because it was the 70s and nobody thought it was a problem. Now we know better. As time marches on we learn new things and adjust. When my daughter was born 16 months ago, I was a new parent and completely lost in the sleep department. Your blog was a saving grace for me! Our kid is a sleeping pro and we owe it to you. I’m more than a little miffed at the way they cited your work but that’s neither here nor there I suppose. 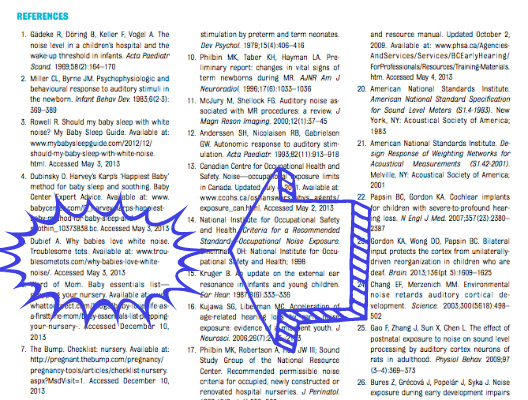 The truth is that I should be delighted to be mentioned in a prestigious journal because even if it’s not entirely complimentary I can now say, “As seen in the Journal of Pediatrics” which is cool. Also my blog (not me sadly) got onto Good Morning America. So I am siding with the “all PR is good PR” side of things. For what it’s worth, we asked advice about this to a ENT specialist a while ago. He said measurements of decibels are not that reliable because the way sound enters into ears changes and is hard to measure. He told us that if we can talk and hear each other over the sound, then it’s fine. He didn’t seem worried at all. That IS good to hear! I launched myself into research mode after this happened and it does seem that the question of “how loud is too loud” is far more challenging to answer than it would seem. Nobody really seems to know how newborns hear either. There have been studies that suggests they hear far less than we do. But when you study babies it’s all a bit squishy. Shoot… I’ve been using the sounds on the mamaroo as white noise, turned up less than halfway, but still rather loud. Enough that my husband asked if it’s too loud, and I said “no I’ve read that it needs to be louder than you think- as loud as a vacuum or hair dryer”. Guess I’ll turn it down!! Eh don’t beat yourself up about it. The hair dryer is more of an acute “when baby is super upset” volume that people often find helpful with newborns, specifically when they’re crying loudly. Maybe it was a tad too loud but I doubt it’s a problem! Thank you, Alexis, for your wonderful website. I have visited it many times for advice in helping my 14 month old become a good sleeper! I am a firm believer in white noise, especially in a NYC apartment. In general you don’t want anything that involves electricity within reach of the crib because babies grab and bite. So I felt the methodology where they put things IN the crib or within INCHES of the crib was a bit unfair. I mean crib safety would say “no” to that regardless of what the device is. And lets be honest – NYC is loud (OK I’m a country bumpkin so it’s loud to me) and if your white noise wasn’t at least a little loud it wouldn’t be worth using at all! Great post and response to the article, Alexis! I was definitely worried when I read the NYT article yesterday, and I appreciate you providing your reflections on the findings. My daughter is 21 months old and we have been using white noise since she was 3 months old, mostly because of what we read in Dr. Karp’s book and on your blog. and yes, it has been a sleep saver for the whole family! For those looking for specific information about different sound machines (since the Pediatrics article didn’t actually list the individual sound volumes of the ones they tested!) We have the Dohm sound machine, by Marpac. It is not specifically marketed to babies, but we liked it because we thought the sound was less “artificial” than some of the baby specific ones. I believe Marpac was one of the manufacturers who agreed to comment on the record for the NYT article and give their decibel ratings. I measured the sound last night. With the machine on the highest setting (which is what we had been using), about 18 inches from the crib, it measured about 55-56 dB. On the low setting, it measured 48-50 dB. We turned the volume down last night, and are planning to continue using it at that volume. What a reasonable and thoughtful response to this alarming research. Honestly I love academic research and routinely read Pediatrics (where this was published) but where is the reasonable filter here? Lets not freak out parents or force them to spend their free time making sure they aren’t damaging their child when there is no issue with what they’re already doing? So glad you are feeling OK about things and will stick with it. Thanks for sharing! We used white noise with our daughter- based on recommendations from this site 🙂 – and it seemed to help a lot, especially with masking other noises in the apartment that might wake her up. I just downloaded this MP3 http://cantonbecker.com/music/white-noise-sleep-sounds/mp3s.php and played a CD on repeat, turned down low. My husband said it was creepy sounding but it seemed to make a big difference in my daughter’s sleep. She’s almost two now and a great sleeper and eventually we phased it out when she didn’t seem to need it. Love your blog – thanks for all the helpful tips! And yes an old radio or MP3 on repeat work great! This article did freak me out a little bit. My wife and I have used Dr. Karp’s CD of womb and white noise initially when our daughter was 1-2 months. About 2 months ago, we started using the white noise coming from our Graco Glider Elite swing while she sleeps in it at night. I did think the sound was a little loud at first but thought that she needs it that loud to sleep. When I checked the glider elite, the speaker is only about a foot away and pointed directly at the baby’s head! Who designs something like that? I thought all Graco products passed JPMA testing? Granted, there is a thin fabric from the canopy between the speaker and her head. I checked with a db iPhone app and it’s around 60db even at its lowest setting and goes to about 72db on high (measured around where her head is in the swing). We’ve definitely had our daughter listen to the white noise from that swing (which sounds pretty harsh too) all night long for about 2 months straight (she’s 4 months now). I’ll probably not be using the white noise from the swing any longer and just rely on the low white noise coming from our air purifier and humidifier instead from now on which both combine for only about 60db at peak and are more than 5 feet away from her at all times. Hope I didn’t cause any lasting damage trying to follow Dr. Karp’s advice. My only consolation is that her infant threshold for noise is much higher than adults. Thanks so much for posting about this! I wouldn’t have found out any other way. I did not mean that Dr. Karp’s recommendation for white noise was harmful, just that the particular product I used for white noise may have been. I wish the industry would follow the advise of this article and set limits on the loudness and/or warning labels on these machines. How else are we as consumers supposed to know unless the manufacturers take action and tell us. I adore that you are such a concerned and involved parent. For starters, don’t feel bad, you didn’t injure your child. Newborns can hardly hear anyway (this is true) so going a little on the loud side probably was of benefit as she wouldn’t have heard it otherwise. Secondly, you can never count on industry to do anything for you. I wish this weren’t true – but it is. Labels and notification come AFTER something so horrible has happened that legally they’re compelled to do something about it. Does this mean that you will be forever researching stuff to make sure it’s OK? The volume on a radio can go pretty high. Do we turn it to the maximum? No. So why should it be different for the white noise machine? How can you expect parents to make reasonable choices about their child’s safety! No no no, if the manufacturers don’t spell it out for you in blinking letters then you are doomed, DOOMED I tell you. on a related subject, when I was 7 months pregnant I went to a rock concert. The opening band was so loud that i could feel my teeth rattling in my head. I left, thinking that the noise could hurt my developing baby. Have you ever heard reports about that? I looked it up later and saw a bunch of stuff on how it’s so loud in the womb, and the watery environment protects, etc, seeming to make it sound like you couldn’t hurt a baby’s ears in utero. anyway, on the white noise ….. i know this is just a ridiculous comment, but both my kids had white noise on the highest setting and they have excellent hearing and are pretty darn smart. so i just don’t buy this story. I know adults who end up with tinnitus after a loud rock concert but I’m guessing that your womb filtered out most of the noise. This really gets under my skin. I’ve been using the Homedics sound spa on full blast since my daughter was 6 months. She’ll be 2 in a week. We still use the white noise to this day. I downloaded the sound app to check the dbs and as mentioned, 50db is nothing. I’m wondering to listen to the dr. Who commented earlier and disregard this whole thing. Glad to know others are feeling like I am; terrible! But I won’t stop using my 17 month old’s beloved white noise anytime soon, just turning it way down. I think in the beginning newborn stage I may have been using the white noise too loud, and now I feel terrible. It’s so hard to try to do everything right. I feel like I have been doing most things “right” so far but I guess this is my first real parenting mistake. Annoying to have relatives emailing me the NYT article for some reason. Feeling a little embarrassed that I didn’t think of all of this earlier, that it may have been too loud for newborn ears. Here’s the thing – newborns don’t hear like you do. Honestly – there is actual science to back that up. We end up using loud white noise when they’re born because otherwise it doesn’t help. When Dr. Karp talks about turning on the blow dryer when your child is crying he’s not suggesting you do this all night but he IS pointing out that at lower volumes it has no impact. You will have to pry our sound machine from my cold, dead hands. And Alexis I know you are weirded out by being referenced as a source, but I gotta tell you that I have been telling everyone in my area (West Yorkshire, UK) about your website so you are a lifesaver to us. Thank you for sharing this – I LOVE it. In fact she wrote the post I was too chicken to write. I think because I was called out by name in the research I felt a bit timid for calling this what it was outright but the Slate article did. Yay. I emailed her to let her know it’s awesome. Thanks for sharing! what about toddlers, 4 and 5 year olds? anyone bother to speculate on that? There are also a few decibel meter apps with great reviews for free (at least there are for Android phones, which is what I looked at). I’m going to test the level first thing this morning! Your blog is actually one of the reasons we decided to start using white noise, you made it sound so easy to just try. So I tried with just an old clock radio like you suggested. I went ahead and bought on actual white noise machine due to the songs it was still picking up, but all the same, it has been a big help. We were doing CIO for naps just after she turned 6 months, and she napped better once we started using the white noise. We started using it for nights, and it even helped my husband sleep better when we still had her crib in our room. After reading this post, I turned it down a notch. The free app I use it had just over 50db, and now it’s mostly in the upper 40s with occasionally going a little over. I think that will be OK.
I’m sure its totally fine. I’m keeping an eye out for conclusive research on how loud is too loud for babies and it doesn’t exist today. When it does (and hopefully eventually we WILL know) I strongly suspect the answer will be far far louder. Like 85 dB loud. Again we don’t know that today and I’m not suggesting we go that loud today. Just saying that I won’t at all be surprised to find out that the “real” target volume is louder than think. I just use a speaker hooked up to an old ipod for white noise so I have no idea how amplified the sound is. I also hate listening to it through the baby monitor. If I can’t stand it then it would make sense that it would be a problem for our baby. I wanted to measure the sound but I don’t know how these apps work and I really REALLY don’t want to buy a $25 sound meter. To avoid the cost and making myself completely neurotic every time I put our son down for a nap, I downloaded an app and went to the bathroom and turned on the shower (if taking a shower everyday hasn’t made me deaf it probably isn’t going to make my baby deaf). The app said the shower was running around 55-60db. It says my ipod at its loudest is about the same. Now, I’m going to try to stop being an overly anxious first time mom and go with it. It is either that or not sleep. Oh and the shower idea is because of your recommendation, of course! I can’t stand all this. I want clearer info. If its bad for my baby I’ll gladly stop. I hate feeling “paranoid”. 50db is the reading you get when your talking (rather softly). If I’m not mistaken, and I don’t remember if this is from this same article or another. But, wasn’t the pitch mentioned in addition to the volume? Something like the baby’s small ear canals make the pitch higher for them and this is damaging? Anyway – if this is the case other things are called into question: music, background tv, screaming toddler, big truck passing by, etc., right? We get enough flack from our mother/mother in laws about white noise being harmful. It would be nice to have solid findings, huh? Thank you for touching on this. I will read your other links. Ps. I LOVE the photo for this post! As far as I can tell we don’t have a great handle on how babies hear because they can’t tell us. There have been some pretty credible studies that suggest babies hear 30-50 dB less than we do so that what is loud for us barely registers for us. Dr. Karp also references a study that suggests that 80 dB is the ideal volume to improve sleep outcomes. So you’re totally right – clearer info would be better and we don’t have it. Can you help me understand this? Karp has long maintained that babies don’t hear as well as adults. When this whole “you’re making your kid deaf” thing blew up I put in a ton of time looking into it (however I’m not a PhD in Audiology so much of this is greek to me). I found this longitudinal study that suggests Karp is right. I didn’t post it or blog about it because frankly I don’t understand the topic well enough. I believe this study was looking at behavioral thresholds which you’re saying don’t reflect what they can actually hear. So what are the thresholds for objective measures and how accurate are they? I also get confused because if normal conversational volume is ~60 dB why is white noise any worse than the typical ambient noises that kids hear all day? There is a large body of research that says the NICU is too loud and preemies are subjected to too much noise in the NICU. But nothing I’ve found that specifically looks at normal white noise use (what most parents are doing) with their infants. If you know of some research on that I would love it if you could share! I feel like this is common sense. Parents have to remember to use common sense and remember things marketed for babies are in no way necessarily tested to make sure they are meant for babies. Buying baby stuff and using research and your own instincts is really one of the first tests of being a parent. I sleep in the same room with my baby so I can tell when the white noise is too loud. You try sleeping with the white noise first. Lay as far away from it as you would with your baby. Can you sleep or is it way too loud? You can probably turn it up a tiny bit more for the baby but in general if it’s way too loud why do you think your baby could or should fall asleep to it? It’s sad that businesses don’t take more care not to harm precious babies but it’s important to remember your child’s wellbeing is always in your hands, not theirs. My daughter slept to the sound of the vacuum running for the first 6 months. It was all we could do to help her. She has exemplary hearing. She is also a very talented little violin player. You can’t play well if you don’t have perfect hearing and then some.